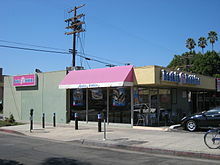 Baskin-Robbins is a global chain of ice cream parlors. It has franchises in more than 30 countries. Out of 5800 locations, 2800 are based in the United States. It was founded in 1953 by the merger of two separate ice cream ventures of Burt Baskin and Irv Robbins, who were brothers-in-law. Before the merger, the two separate ice cream ventures were called Burt’s Ice Cream Shop and Snowbird Ice Cream. Snowbird Ice cream had 21 flavors at the time, which was praised as novel and fresh. After the two ventures were combined into Baskin-Robbins, which would later become a world-famous ice cream parlor, pushed the slogan of ’31 flavors.’ Baskin-Robbins was creative in its approach to put forward the sampling system—letting people taste the different flavors of ice cream with small, single-use pink plastic spoons until they find the flavor that they want. Also, Baskin-Robbins was the first to introduce the ice cream cake to the public. This page was last changed on 9 April 2019, at 20:07.